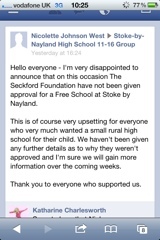 The DfE have turned down the Seckford Foundation's bid to open a third free school at Stoke by Nayand. A bid by a local group to open a school at the Middle School site that closes in July 2013 was also turned down last year. Local campaign group Compass points out that there is already an oversupply of school places in the area and a choice of schools as they celebrated seeing off the Stoke bid for the second time. The news broke around 2.30pm yesterday when the school failed appear on the free school list published by the DfE. Indeed no mainstream Suffolk schools were on the list as the controversial Steiner school proposed for Woodbridge and a free school proposed for Felixstowe was also turned down. Later in the afternoon the parent group broke the news on its Facebook group but the Seckford Foundation remained strangely silent. Promises to update the Stoke by Nayland website as soon as there was any news were not kept. Even the Seckford Foundation are going to have a hard job spinning this as anything other than failure. Yesterday they were desperately trying to spin the disaster of their Beccles school by boasting that applications has risen by 48%. Impressive until you realise they mean they now have 55 rather than just 37 for three whole year groups in a secondary school. With the disaster of Beccles, low numbers at Saxmundham and now the failure of their Stoke by Nayland bid the dream of a chain of schools is looking increasingly unlikely. Indeed this might also be the end if the line for Stoke by Nayland bids as they now lose the opportunity to to grab three year groups in one go afforded by the school organisation review. And parents campaigning for a free school would now be blighting and damaging local schools their own children are attending so may well think twice. There are already strong rumours of at least one further bid for an Ixworth Free School and if the parent group there have any sense they will drop Seckford like a bad penny. Clearly the Foundations failure to deliver on promised numbers (or anything approaching them) at Beccles and Saxmundham has damaged the bid for Stoke by Nayland. Parents have taken the Foundation's "your child, your choice" slogan to heart. They just decided in the main not to choose a Seckford school for their children. It’s not possible for a high school of 37 pupils to provide an educationally sound curriculum and it’s not financially viable, unless the government robs other schools of even more public money by providing funding for the ‘estimated’ 300 plus pupils instead of the actual 37. That’s why normal schools that become this small are closed down. I imagine that parents of the 37 children will now think long and hard whether they really want to risk sending their youngsters to such a place. Bob is the former Labour MP for Waveney. The argument is no different with 55. In fact both Beccles and Saxmundham have have lost numbers from the 80 or so and 120 plus they had in February. I don't know if it is pride or what that has prevented Seckford taking the olive branch of consolidating both schools at Saxmundham. But virtually every news report on yesterday's free school announcement mentioned the "Beccles 37". By persisting in opening a school almost nobody wants or needs the Seckford Foundation have brought themselves and indeed the whole free school programme into disrepute. With the approval of the much more interesting and innovative science and Maths sixth firm free school in Norwich there is a hope the DfE are becoming more discerning with free school bids..
New schools need to meet genuine local need or provide genuine innovation. The Seckford bids do neither. It is beginning to look like the behaviour of the Seckford Foundation and it's supporters in recent days might have been motivated by anger at having failed. With attempts to censor and silence leading critics including myself the Foundation and it's supporters have shot themselves in the foot. They need to quit shooting the messenger and take a long hard look at what they are offering and why it does not appeal to so many parents and children. Arrogantly thinking you know best isn't working. Is it really right 55 children should start their secondary school career in a tiny unsustainable school? To me it looks like the children's interests have been forgotten in a saga that has been all about the adults.